Although one can now see people of enormous girth waddling down the streets every day, fat people have always been essential attractions in the world of the sideshow. No self-respecting ten-in-one could do without a fat man or fat woman — or an entire obese family — on the platform. These rotund performers were traditionally given ironic names (Baby Thelma, Tiny Tina, etc.) and claimed hyperbolic weights that far exceeded their actual poundage. Furthermore, with names like Happy Jack and Dolly Dimples, these performers were presented as jolly comic figures. That fat-and-happy persona became so engrained in our cultural psyche that it carried over to hefty performers in other areas of showbiz, such as Roscoe "Fatty" Arbuckle and Jackie Gleason. Few artists in history have devoted so much paint and canvas to large women as did Peter Paul Rubens. 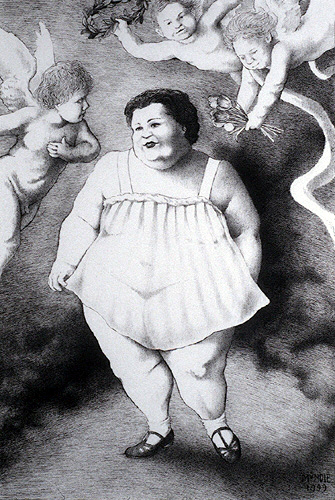 His very name became an adjective for curvaceous women, so I thought I would present a classic sideshow fat lady as Rubens might have done — a triumphal apotheosis with flapping putti, tulips, and all. Pitch items from Baby Thelma and several of her obese show compatriots may be seen here.